We're in the midst of a bona fide broadband boom. High-speed internet access is available across 99 per cent of the UK, with mainstream speeds at 8Mbps and many exchanges capable of up to 24Mbps. That's fast enough to comfortably watch streaming video online or download audio tracks from online stores in seconds. However, it's a misconception to think that all broadband packages are the same. We've selected five UK packages that are perfect for specific needs. You're sure to find a bundle to suit you among our recommendations. With UK broadband adoption now hovering around 60 per cent of the population, the definition of 'casual use' is more demanding than in previous years. A casual user is no longer someone who browses a website occasionally and maintains an email account. They rely on their internet connection for a variety of high bandwidth uses – so it's important to balance value for money with speed and reliability. The price of basic broadband has taken a nosedive in the last five years. The key is in picking the right bundle – and the right bundle may be more basic than you think. Many ISPs market broadband packages that provide perks like free landline calls, cheaper mobile deals, Wi-Fi equipment and antivirus apps. If you actually need all those things, you might save some money. But the problem with this approach is that you're forced to put all of your eggs in one basket. If, for example, you have cheap broadband provision from your mobile phone provider and the broadband portion proves unsatisfactory, you may find it difficult to extract yourself from the contract tying the two together. We think it's more important to get the fundamentals right than allow yourself to be attracted by shiny frills. For casual use – even when that includes streaming the occasional video or talking to friends on Skype – you should look for at least an 8Mbps connection. We say this because there are still some 2Mbps deals floating around. 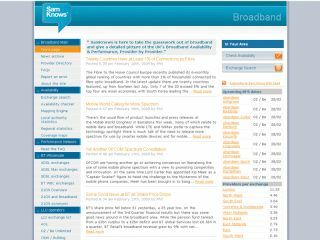 UK Online offers a 2Mbps 'unlimited' service at a cost of £14.99 to business users, while Sky bundles a 2Mbps connection for a fiver with Sky TV packages. Here's our advice: if you're on a 2Mbps service, ditch it and switch now. Changing to an 'up to' 8Mbps package will guarantee a significant speed increase in the majority of cases, even if it's only to 3 or 4Mbps. As for price? A vanilla package from Plusnet with a 10GB download allowance, free Wi-Fi router and 24-hour support costs £5.99 a month. No hidden overheads or frills. The only setbacks are that you're tied into an 18-month contract and the subscription increases to £11.99 in some areas of the country after three months. However, if a better Plusnet deal comes along during your contract period, you'll be able to renew and switch to that one. ADSL broadband switching is fairly easy; you'll need to get a Migration Authorisation Code (MAC) from your existing provider and pass that on to your new ISP within a month of receiving it. They'll take care of the switch over, cancelling your old account. The process usually takes around 10 to 14 days, and you shouldn't have any interruption to your service while this happens.